Outside the Shell meeting was a Khoi leader wafting buchu smoke over the proceedings. While they wait for Government to issue their exploration permit to explore and frack for shale gas in the Karoo, Shell spin-doctors have embarked on a relentless quest to meet with tourism bodies, farmers, retailers, church groups, municipalities and community organisations. This meeting with Shell promised to be quite different. Anyone who will listen, really. But right from the beginning, their 1 November 2013 meeting with farmers, Khoi leaders and Treasure the Karoo Action Group people at Kudu Motors in Graaff-Reinet promised to be different. For a start, there was the unusual sight of a man in animal skins crouched by the door, wielding a set of kudu horns with a metal attachment from which wisps of buchu smoke emerged. Niall Kramer of Shell spoke first. 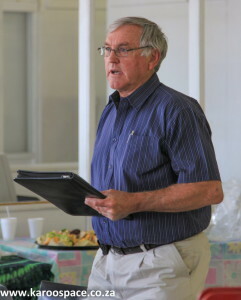 Farmer Peet van Heerden chaired the meeting. Bob Govender added clarification on some points. 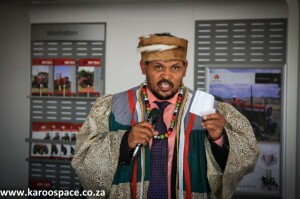 Inside, there were other Khoi people in full regalia, sitting among the farmers and members of the anti-fracking organisation, Treasure the Karoo Action Group (TKAG). 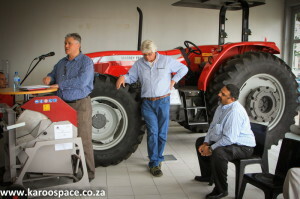 If Shell’s Niall Kramer, Bob Govender and Gheneez Munian felt uncomfortable surrounded by farming implements – the very industry that their activities threaten – they hid it well. The gathering had come about because Shell had contacted farmer Johann Minnaar of Groenvlei farm near Nieu Bethesda, requesting a meeting. 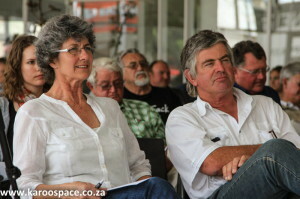 Lynn and Johan Minnaar of Groenvlei Farm. Johann is father of Jolynn Minnaar, who will be releasing her documentary on fracking in South Africa in the next few months. 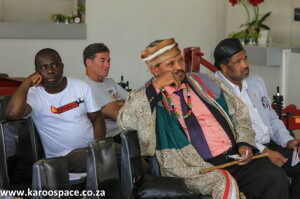 Minnaar told them he had no wish to meet them alone and said they should rather address all the farmers. The farmers chose the venue and brought the snacks (supplied by Spar). It was never going to go well for Shell. 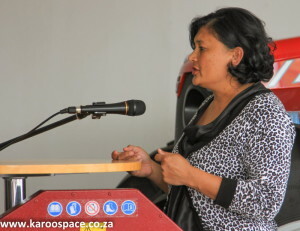 Daantjie Japhta, leader of the Inqua clan, said the Khoi people had decided they would not allow fracking in the Karoo. 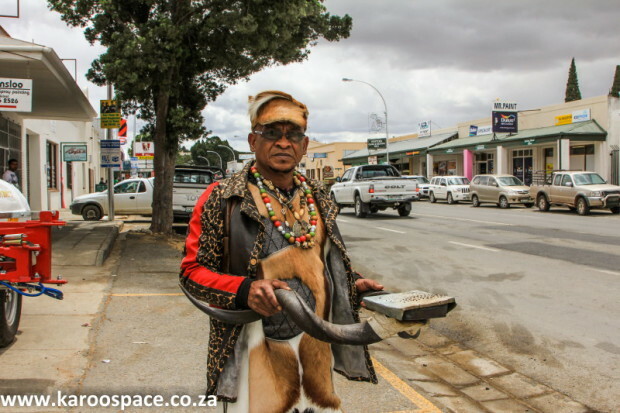 Daantjie Japhta, former mayor of Graaff-Reinet, present head of the Khoi’s Inqua clan and Vice-Chairman of Treasure the Karoo Action Group, stood up in his full regalia and gave the Shell people hell. He received a huge round of applause from the crowd. 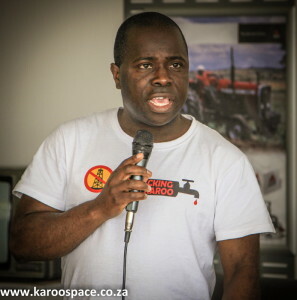 Pastor Barry Wuganaale, related to Ken Saro-Wiwa, knows Shell’s corporate tricks only too well. Pastor Barry Wuganaale, who took over as Chairman of TKAG from Jonathan Deal this year, said he found Shell’s message and rhetoric uncannily similar to their rhetoric in Nigeria. Kramer hotly denied this, saying that the population density, the nature of the product and law enforcement issues made this completely different. “We want to make this a benchmark project,” said Kramer. Gheneez Munian of Shell answered a contentious question on compensation. Gheneez Munian answered carefully that South Africa’s legislation demanded that they put up a guarantee which would be evaluated during the EIA process and quantified by regulatory formula. Shell will comply with Government’s regulations, she said. There was a low but audible groan from the crowd. Jonathan Deal challenged Shell on many issues, including their Econometrix study. Jonathan Deal, founder of TKAG, challenged Shell on its insistence that the Econometrix study they had commissioned was realistic on its projections for jobs and income that would be created by shale gas mining. As the meeting went on, Shell’s answers became terser. They dodged Jolynn Minnaar’s questions about whether any part of the fracking process had contaminated groundwater in the US. It was a barbed question and they knew it. 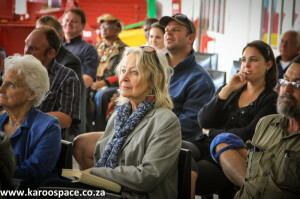 Shell people were unwilling to answer Jolynn Minnaar’s questions. “Fracking happens very deep in the earth. We are unaware of any cases of contamination,” said Kramer through clenched teeth. They clearly didn’t want to answer Charlotte Daneel either. Daneel said she had recently returned from the Netherlands where all the talk was about Shell’s CEO Peter Voser and how he’d said in an interview with the Financial Times that his greatest regret was getting the company into shale gas and that it was not as financially viable as it promised to be. Charlotte Daneel (centre) had a question that made the Shell spin-doctors quite uneasy. “Why is Shell pushing to frack here if they are selling up their shale gas options in the US?” she asked. “There is a large amount of shale gas activity in the US. Prices go up and down in markets like that,” replied Kramer. Finally farmer Dougie Stern stood up and took Shell to task. Their massive $2 billion loss from shale gas in the US was part of the volatility of the industry which is moving from boom to bust. Shell was leading the South African government into a failed economy, he said. Farmer Dougie Stern, who has travelled to the US to see fracking first hand, led the walk-out. “Also, Shell tried to get exploration rights before there were any regulations governing fracking in this country, because regulations just slow you down. Thank God we had a lawyer like Derek Light to oppose attempts to frack in the Karoo otherwise you would already have left this place a wasteland. “When there was a Rift Valley Fever outbreak, China refused to buy our wool. If our land and our livestock are contaminated, or if there’s even a suspicion of it, the impacts will be huge. Could we rely on Shell to compensate us? With that, everyone bar the Shell people and a few others stood up and filed out the door. One farmer had the presence of mind to nip back in and retrieve the snacks, and so, during Church Street’s lunch-hour traffic, farmers, Khoi leaders and anti-fracking activists mingled and nibbled cheese sausages and egg-mayo sandwiches on the BP forecourt outside Kudu Motors. The Shell people left hungry. Mingling over snacks in BP’s Kudu Motors forecourt after the Shell meeting walkout. Great article. Thanks to all who were there to represent so many of us from ALL over SA who couldn’t be there! There is plenty of evidence fracking is not the way to go and they are ridiculous to even think they are going to proceed. Their ‘schedule’ is of no interest – besides, they won’t be needing it!! This whole issue has brought the community together, more so than ever and now is a wonderful opportunity to create sane solutions for our future through intelligent care of our environment, for the good of all humans, animals & plants. How wonderful is the report of this meeting, it seems like the tide of public opinion has well and truly turned against the violation of our beautiful land. This gives me real hope for the first time that this disaster will be averted. Well done to all who attended the meeting and made their voices so clearly heard. The future looks brighter for a sunny South Africa without shale gas! Baie, baie, BAIE dankie vir almal wat so hard gewerk het om fracking te stop! Thank you so much for everything that the people of the Karoo do to stop fracking! I am aware that fracking in the Karoo would have huge detrimental impacts (financial, social, but mainly environmental) on the rest of the country, in all corners, so thank you on behalf of everyone else! Please don’t think it goes unnoticed or unappreciated. I also have HUGE respect for you to stand up to Shell, a huge company that many would feel afraid of doing. We need more people to wake up, stand up and realise that you do have the power to stop something like fracking on your doorstep, and all you need to start with is your own voice! Please keep doing what you’re doing. I wish I could be there in person. You have my full support! Where did the tractor come from? Was it there already or did they bring it as a petty psychological trick to get people thinking about what prosperity might bring? Secondly, the popularity of fracking means that the price of natural gas has plummeted worldwide, not just in the US as was claimed. And from what they say it seems as if it will take several years before they can even begin, and by then we’ll need to start cutting carbon emissions as much as possible, not just switching to ‘less dirty’ fuels like natural gas. The tractor was already there. 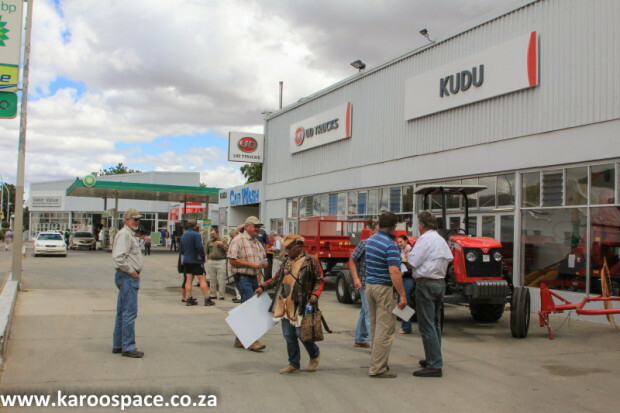 Kudu Motors has many agricultural implements and vehicles, and the Massey Ferguson tractor just happened to be there, behind the speakers. The farmers chose the venue. In the begining of the article, the venue was established as Kudu Motors, the name lends itself to farming. Farming implements and tractors were not some trick. Kudu Motors actully sell tractors and implements. You sound af if you’re pro-fracking? One question, do you own property in the Karoo? Thank you for fighting the good fight! Nice touch taking the snacks. Shell’s arguments all sound very reasonable. Let’s hope the exploration is a success and we all benefit from the productive use of this under-utilised land. Andrew ~ I think you need to do some research!! Esme, why don’t you drop the emotion and get educated? Have considered the merits of gas at all? Do you know how big – or tiny – a well pad is? You are willing to allow Shell to risk our underground aquifers and water supply for everything, just for some short term profits? Truly, you do need to do some reading – outside of Shell company propaganda. Please note a correction: It was not Janine Nel from Shell, as previously stated, but Gheneez Munian who was there with Niall Kramer and Bob Govender. You make us proud and light the way, you fabulous fellow farmers, First people, Spar, Treasure the Karoo – all of you! Thank you! And power to all who love the land! This meeting was a bit like a rumble of a distant violent storm that is heading our way. I have long since, or more correctly, never heard such an unanimous voice from fellow citizens. If the powers that be and Shell don’t come to their senses a campaign is going to set off a full blown tsunami of resentment and action. All the damage that they want to do to this area, is for a production period of less than five years. Please come to your senses. There are other options. The expected ten years to do the exploration, with resultant damage could be used to develop alternate renewable energy sources. We can all work together, even Shell can join, and make a meaningful contribution for generations to follow. If you accept the disgusting waste of trillions upon trillions of gallons of water gone forever, for all future generations, if you accept the possibility of poisoned aquifers, if you accept that thousands of these drill pads will be required and the subsequent vast loss of delicate eco-systems, if you accept that each of these thousands of drill pads require countless thousands of heavy lorry trips per drill pad and the ensuant diesel pollution, if you accept the toxic vapours that are spewed out from this heavily industrialised practice from the high pressure kit and flares and if you accept that this scumbag industry will dodge and fight legislation to lie and bribe its way to maximise its profits, usually with no social license and extreme anti democratic vigour….how on Earth can you accept the further digging up of dirty fossil fuels when, if we have ANY chance of restricting global warming to 2C, up to 80% of known fossil fuel reserves HAVE to stay in the ground!! The latest IPCC warning came out a few weeks ago…it made the news for a few days then disappeared like it had never happened. There is a reason for this, just like in every fracking comments section that I’ve ever read contains the usual industry shills attempting to play down the effects of fracking. We people are battling against a multi billion dollar PR industry that will try every trick in the book to down play the disastrous effects of fracking. The good news is that fracking is so abhorrent that to cheerlead for it you have to make yourself look such an idiot that its hard to get taken seriously by anyone thats taken even a cursory look into the process. There is a reason why well read ordinary NON ACTIVIST type people from ALL OVER THE WORLD are fighting this. There is a reason why the industry (particularly here in Britain) is trying to impose this industry upon us in the quietest way possible with the minimum public debate and the removal of local democratic processes…the reason is that fracking is just plain WRONG. 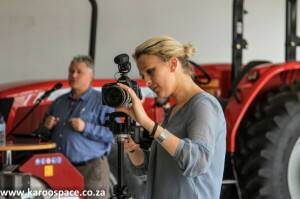 Having read Julienne du Toit’s report on the farmers’ meeting with Shell at Kudu Motors, I could not help feeling absolutely humble…. I live around the village of Graaff-Reinet in the middle of the Karoo and am surrounded by world class folk. Julienne’s report is as accurate as my fingerprint and makes for wanting to read more! The best… In facilitating this meeting, Peet van Heerden had no idea what was going to be thrown at him. He handled it better than a famous Afrikaans TV presenter did, during a television interview with Shell and our Derek Light, on the topic. Daantjie Japhta almost “stole the show” with his adamant, not even debatable, argument. Jonathan Deal and Barry Wuganaale, as always, on top of it. Jonathan, your recent international award was long overdue. Jolynn, my child, your folks and the Karoo citizens are immensely proud of you. You took it upon yourself to challenge a world giant on their conduct, without a single penny’s worth of subsidy from anyone. How you financed this, we will never know. Derek Light, my/our lawyer, you single-handedly stopped the first round of exploration rights to these oil companies. a Karoo lawyer against an international giant! World class! 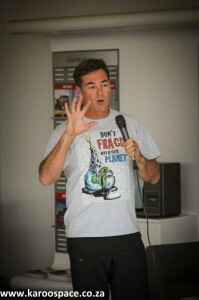 Doug Stern… to stand up in a public meeting and call Shell International untrustworthy, telling half truths…., that is a mark of a man in our book! Lastly, Kudu Motors and personnel… to openly associate yourself with the farming community against fracking, I have already taken my hat off to you. I now know, Shell… you do not have a snowball’s hope in hell in the Karoo. The best and most capable people in the world, right on my doorstep…what a blessing. 1. The only people that will benefit from fracking, in this case, is Shell and the government, both with the only agenda to enrich themselves. 2. If a First World country like Germany, a world leader in almost every area, puts a ban on fracking in their country, shouldn’t that tell us something? Thank you to all who made this meeting possible. Let us continue to reunite against fracking!! The meeting sounds amazing I am so happy that you are all out there fighting to save our wonderful land BUT WHAT ABOUT THE OTHER COMPANIES THAT ARE QUIETLY EXPLORING THE FRACKING OPTION? I am certain sure Shell is not the only one, I know our very own Sasol is also in the game. Don’t let the other oil companies slip in on the sly. Well done all those standing up to the deceitful might of Shell and the ANC! The Secrecy Bill (= protection of corrupt ANC officials Bill) will assist in disguising the obvious kick backs to many cadres. Like the ANC, Shell are economical with the truth. A few questions? 1) Why do they continue refuse to name the cancer forming compounds (from Halliburton) they add to the witches brew of cocktails they indiscriminately pour into the earth? 2) What is the natural ecology of our aquifers – over millenia? 3) We are a water poor country – EACH FRACKING well uses up to 9 million litres of water a day! Where is this coming from?? 4) HALF of this water is heavily contaminated/polluted – even with carcinogens. What WILL Shell do to remove the mixture of contaminated water, gas, metals and naturally occurring radioactive materials that flow to the surface AFTER fracking has stopped? 5) What bribes have been made to ANC cadres? The Karoo might be an arid semi-desert but it is still able to sustain those who have inhabited it for 100,000 plus years. Take this harsh sustainable life-source (part of their spiritual soul) away from them and we have genocide. I heard that the fracking is going to start next year 2014 any one shed any light on this. The ANC Government is very keen to allow fracking as soon as possible, but many laws need to be amended first. South Africa has no regulations on fracking, and more worryingly, none on drilling, which causes the most contamination. Keep watching our News section for updates on fracking. I am so proud of the people of the Karoo. This cannot happen, the ANC has screwed up too often, mostly for personal gain. We need to preserve this land for our children and grandchildren. Fracking will not put food on the table. A healthy people make for a healthy nation. I thank you on behalf of my family and descendants for fighting the good fight. Big up to all of you standing up for our rights. They want to start in the Karoo and if not stopped will spread their disease all over our land. Everypne MUST watch ‘Gaslands’ 1 and 2. We have to arm ourselves with as much knowledge as possible. United we stand!